View of the West prospect of Hereford Cathedral by I. Wathen. 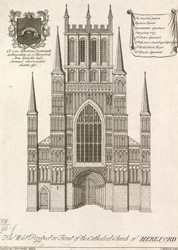 In the 18th century the West tower of the Cathedral collapsed destroying the front and the nave. Before the collapse of the wing a single axial tower stood here, an unusual feature in English cathedrals and more common in France. The architect James Wyatt designed and built a new wing which can be seen in this print. Between 1904 and 1908 Oldrid, the son of Sir Gilbert Scott, built a new front.